TELUS’ ‘TVs for Good’ effort helps the company deliver customer conversions 40-50% above forecast. TELUS, the second largest telecom company in Canada, attributes its solid brand differentiation and customer loyalty in large part to strategic cause marketing initiatives. Fortunately for us, this Halo Award winning company is not only generous with community-related efforts, but also in sharing their lessons learned with our community. TELUS’ Jill Schnarr presented the December Cause Marketing Masters webinar this week to give us a glimpse behind their cause marketing strategy and successes. One TELUS program that pays big community and business dividends is the ‘TVs for Good’ initiative. Now in its 5th year, the campaign donates $100 to a local charity for each customer that switches to TELUS. 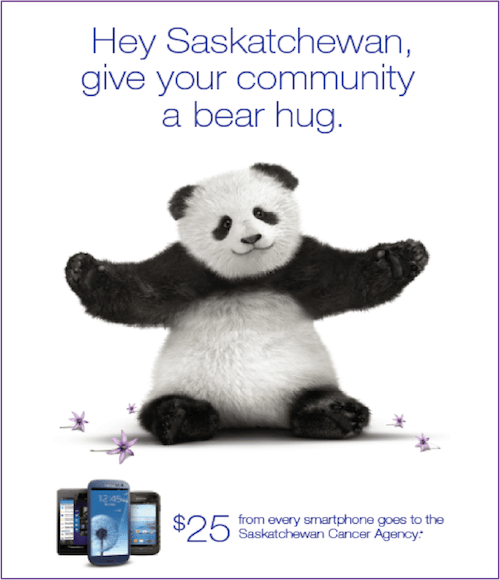 According to Schnarr, this campaign is by far TELUS’ most successful cause marketing campaign. Compared to communities that don’t operate this campaign that perform 0-5% above forecast, communities where ‘TVs for Good’ is active perform at 40-50% above forecast. The TELUS ‘Go Pink’ cause marketing effort helped the Canadian telecom company achieve social media leadership. TELUS also boasts the highest share of social media engagement in their competitive space. How did TELUS achieve this leadership? 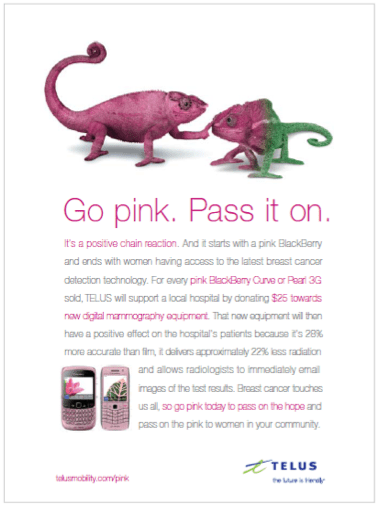 In 2010, they gained 470,000 new Facebook fans in one month during their hugely popular TELUS Go Pink cause marketing effort that tied a $25 donation to the purchase of an exclusive pink Blackberry. Clearly the telecom company has worked hard to continue to engage and grow their fan base but it was a cause effort that first attracted wide-spread attention. To learn more about the TELUS cause marketing experience including the performance metrics they have linked to their cause efforts, check out this information-packed webinar! As always, Cause Marketing Masters webinars are FREE to members (not a member yet? Join today!) or $99 for non-members.